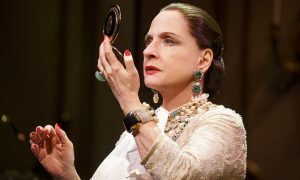 Now premiering at Goodman Theatre, the production stars Tony Award winners Patti LuPone as Rubinstein and Christine Ebersole as Arden. So first, you have the magnificent voices and personalities of two Broadway headliners. However, there isn’t a song to take home in this musical by composer Scott Frankel and lyricist Michael Korie (“Grey Gardens,” “Far From Heaven”) and librettist Doug Wright (Grey Gardens, The Little Mermaid). But LuPone and Ebersole so powerfully interpret the score that by the show’s end you realize the music reflected Rubinstein’s and Arden’s drive to power. Rubinstein and Arden turned women’s desires to be appealing to men into multi-million-dollar enterprises. They understood that what they sold was hope and exclusivity. “There are no ugly women, only lazy ones,” Rubinstein says in the show (in an oft-mentioned quote). Born 1902 in Krakow, Poland, Rubinstein was supposed to marry a widower her father picked. She went to Australia where she turned the jars of beauty cream her mother made into a business. Backed by money from a woman who believed in the creams, Rubinstein expanded her Australian operations. Her success prompted a move to London and her route to an international company. She married journalist Edward William Titus in London in 1908, where she opened a famous salon, then one Paris in 1912. They moved to the United States at the start of World War I where Titus helped with publicity and formed a publishing company. Born Florence Nightingale Graham to a farming family in Woodbridge, Ontario, Canada in 1878, Arden left nursing school and went to New York. She worked at E.R. Squibb Pharmaceuticals Co. and then with a beauty treatment business before opening a Fifth Avenue salon with Elizabeth Hubbard in 1910. When that partnership ended in 1914, Graham kept the name Elizabeth and is said to have adopted the name Arden from a farm she knew. Based on a book of the same name by Lindy Woodhead and the documentary film “The Powder & the Glory” by Ann Carol Grossman and Arnie Reisman, what you see in the musical is that neither of the two beauty business tycoons would say her rival’s name or care to meet face to face (though the musical chooses to have them do so at the end). David Korins set design beautifully fits the scenario of two cosmetic dynamos who won’t meet face to face but are often on stage in their studio/office backdrops at the same time. They both refused to appeal to the masses even though their marketers (who switched allegiance), called them dinosaurs in the musical as their businesses’ bottom line started to falter. But don’t feel sorry for them. What is not in the musical is that Rubinstein sold her American businesses to Lehman Brothers for a reportedly $7.3 million in 1928, bough it back during the Great Depression and rejuvenated the business so it was worth several million dollars upon her death in April 1965. Helena Rubinstein, Inc. was bought by Colgate Palmolive in 1973 and currently is owned by L’Oréal. Arden died October 1966. After various board changes, Elizabeth Arden was bought by Eli Lilly in 1971 for $38 million. It is reportedly worth more than $1.3 billion, today. As to the men in their lives, John Dosset does a fine job as Arden’s husband and market manager Tommy Lewis who resents being called Mr. Arden and not getting credit for his contributions. Douglas Sills is Harry Fleming, Rubinstein’s promoter who wants a raise and more hours for his private life. The sleeper is Erik Liberman who is terrific as Revlon founder Charles Revson. 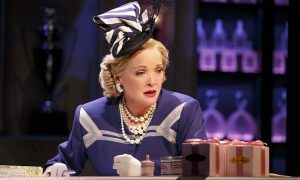 Part of the fun of seeing War Paint, are the wonderful costumes and period hats designed by Catherine Zuber. Even though the musical is a period piece that reflects an era, the selling of hope in a bottle and the concepts of pampering remain today. Details: “War Paint,” directed by Michael Greif, is at Goodman Theatre, 170 N. Dearborn St., Chicago, IL 60601, now through Aug. 21, 2016. For tickets and other information visit Goodman Theatre http://www.goodmantheatre.org/ and call 312-443-3800.